Art has always been a part of Sharlene Bohr’s life. Her connection to textiles began at a young age with her mother and their mutual fondness for quilting. She loves to play with color and pattern and that has combined with her appreciation of nature, born from growing up in rural NE Iowa. 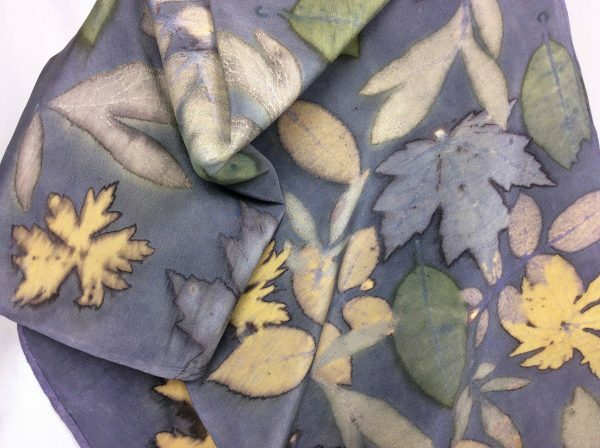 She first discovered eco-printing while living in Los Angeles, CA. A friend of hers introduced her to the process and she became captivated from the moment she unwrapped her first piece. Bohr solely uses natural dye sources because the colors that come from nature possess a special quality that’s not found in manufactured dyes. Bohr also likes how regional plants reflect the area in which they are found, and how the colors change as the seasons progress. She especially likes to mix natural dye techniques, play with different metals, and layer up fabrics to add texture and dimension to her work. Some of Bohr’s favorite design moments are in the creation of a piece meant to hang on the wall. Sharlene currently resides in Cresco, IA. In her studio there, you’ll find her wrapping fabric around pipes, rocks and sticks, letting the magic of nature reveal itself through her textiles.